Live Twitter Updates This Weekend! This weekend is a big one for the Berk Technology Time Attack Race Team! It is Round #4 of the 2010 Redline Time Attack series and it will be held at our home track, Auto Club Speedway in Fontana, CA! Last time Berk Technology ran this track it was for the 2009 Redline Time Attack Finals in November of last year. At that event, we ran a 1:54.909 which still stands as our best time at that track, however that was only good for 5th place. 1st place, and the current Street Tire RWD record was set by Jeremy Croiset in the Berk Technology/MCS Toyota MR2 at a 1:50.692. This year, heading into the event, we know we have a much more capable car, but will it be good enough to break the track record, despite the weather being 20+ degrees hotter than it was back in November? Will we get our third straight podium finish this weekend? Will we take the championship points lead this event? How will we do in our Super Session debut? This weekend is sure to be full of drama and excitement, and you don’t want to miss it! 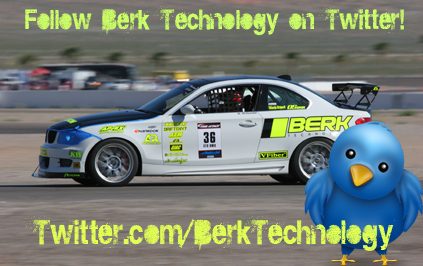 Get the inside scoop on whats going on with the Berk Technology Time Attack Race Team by following us on Twitter all weekend long! We will be updating our Twitter account from the track all day Saturday and Sunday so join in to see if we can win the event, take the points lead, and set a new track record! This entry was posted on May 28, 2010 at 7:34 am and is filed under General News. You can follow any responses to this entry through the RSS 2.0 feed. You can leave a response, or trackback from your own site.